Next week, there’s another hot sandwich, a post on one of my favorite things, and I booze up a favorite childhood treat. Spicy Chicken Bacon Avocado Grilled Cheese Sandwich – A grown up grilled cheese sandwich loaded with bacon, avocado, chicken, and pepper jack cheese. 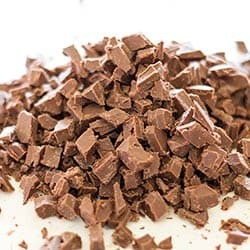 Homemade Nutella Chips for Baking – A simple and easy method for making homemade Nutella chips for baking. 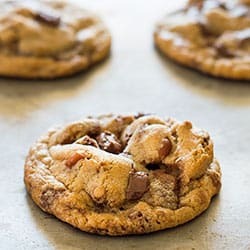 Salted Pretzel and Nutella Chip Cookies – Delicious cookies with chunks of salty, crunchy pretzel and homemade Nutella chips in every bite. Man, as a long-time fan of both Scarlet Johansson and Ghost in the Shell, this whole mess just bums me out. In not bummer casting, I had a dream and a wish we’d get a Jonathan Tucker Low-Key Lyesmith on American Gods, and we did! Moving on to another Neil Gaiman novel I love, it was announced this week that Good Omens is being adapted into a mini series. (I, uh, did not cry ugly tears reading the Terry Pratchett mentions in that article.) This is one of my very favorite books, so I’m excited to see how this one turns out. Finally, we’ve reached the point in the insanely long Marvel Captain America press tour where all possible serious articles on the existing footage/trailers have been written, and we start getting posts like, “All the times Chris Evans has touched his left pec while laughing.” I love this point in Marvel press tours. Can’t wait to see what this boozy childhood treat is!! Looking forward to your next hot sandwich! Ooh I could go for those pretzel Nutella cookies! Will definitely be checking in to find out all about that boozy childhood treat haha – sounds intriguing! Fingers crossed that mini series works out for the best, always a worry when movies and tv shows don’t quite do the book justice. I’ve just started watching Stephen King’s “11.12.63” – so far, so good! Thanks! I’ve heard good things about that one. It’s on my to-watch list!